Introduction. Visual Processing. Texture Segregation Based on Line Orientation Develops Late in Childhood. The Roles of Sustained and Transient Channels in Reading and Reading Disability. Do Dyslexics Have a Visual Deficit? Manifesto on Dyslexia. One Word at a Time: a Solution to the Visual Deficit in the Specific Reading Disabled? The Effects of Wavelength on Visual Processing and Reading Performance in Normal and Disabled Readers. The Role of Visual Processing in Good and Poor Readers' Utilization of Orthographic Information in Letter Strings. The Optimal Viewing Position for Children with Normal and Poor Reading Abilities. Vision in Dyslexics: Letter Recognition Acuity, Visual Crowding, Contrast Sensitivity, Accommodation, Convergence and Sight Reading Music. Fixation, Contrast Sensitivity and Children's Reading. Perceptual and Cognitive Factors in Disabled and Normal Readers' Perception and Memory of Unfamiliar Visual Symbols. Linking the Sensory and Motor Visual Correlates of Dyslexia. Toward an Ecologically Valid Analysis of Visual Processes in Dyslexic Readers. Some Reflections on Psychophysical Measurement with Dyslexic Children. Eye Movements. Saccadic Eye Movements of Dyslexic Children in Non-Cognitive Tasks. Saccadic Eye Movements in Dyslexics, Low Achievers and Competent Readers. Eye Movements in Reading Chinese: Paragraphs, Single Characters and Pinyin. Reading Vertically Without a Fovea. Eye and Head Reading Paths in Hemianopic Patients. Language Processing. A New Theoretical Framework for Understanding Reading and Spelling Tasks. Information Integration and Reading Disabilities. Visuospatial Ability and Language Processing in Reading Disabled and Normal Children. Rate of Elementary Symbol Processing in Dyslexics. The Development of Symbolic-Motor Performance in Minimal Brain Dysfunction Boys. Attentional Correlates of Dyslexia. Possible Attentional Origins of Word Decoding Deficits in Dyslexia. Toward the Origins of Dyslexia. The Development of the Autonomous Lexicon of Reading Disabled Students. Emotional Correlates of Dyslexia. Personality Characteristics of Adult Dyslexics. The Emotional Effects of Dyslexia. Definition and Early Diagnosis of Dyslexia. Dyslexia: Issues of Definition and Subtyping. Patterns of Development in Good and Poor Readers Age 6-11. Development of the DEST Test for the Early Screening for Dyslexia. Remediation: Principles and Techniques. Dyslexia Therapy: In Search for a Rationale. Reason, Rhythm, Relaxation and the New Literacy: Implications for Curriculum Differentiation to Meet the Special Educational Needs of Pupils with Specific Learning Difficulties. Systematic Phonology: The Critical Element in Teaching Reading and Language to Dyslexics. Computer-Based Spelling Remediation for Dyslexic Children Using the Self Spell Environment. Visual and Linguistic Determinants of Reading Fluency in Dyslexics: a Classroom Study. Ophthalmologic Aspects of Dyslexia: Binocular Full Correction of Dyslexics with Prismatic Glasses. The Orthoptic Treatment of Dyslexia. Illiteracy in Adults: Results from a Survey Study of a Reading and Writing Tutorial Program. Reading Acquisition in Analphabetic Adults. Indexes. Developmental Dyslexia has been a subject of interest to practitioners for more than a century. Despite its long research history, however, dyslexia (the terms specific reading disability, reading disability and learning disability are also used interchangeably in this volume) still provides a challenge for contemporary cognitive psychology, education, neurology and physiology. 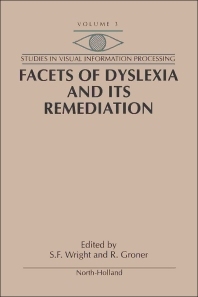 By bringing together contributions from researchers and scholars working in a wide range of fields and perspectives, it is hoped that this publication will offer a means of considering different facets of dyslexia, and enable a greater understanding of reading disorders and their remediation to emerge. The book is divided into eight major sections, the focus in each section being on a different facet of dyslexia. It is hoped this framework enables the reader to assimilate the wide range of pure and applied research and even give rise to a new perspective for the understanding of dyslexia.